Soho Wireless | Premium, on-ear headset with simplified Bluetooth® connectivity. Premium, on-ear headset with simplified Bluetooth® connectivity. Today’s wireless information sharing is streamlined and simplified with Bluetooth®-enabled connectivity, together with NFC and aptX and AAC coding for lossless data exchange and access to multiple devices.A handy bypass cable allows you to stay connected to your sound should your battery power drop while an included USB cable allows you to charge as required. Ear-cup-mounted buttons for simple volume, remote and microphone control to easily manage music and calls. Trust Harman Kardon to provide exceptional acoustic definition and refinement to match its accelerated sense of style and function. Using only the finest in craftsmanship and the ultimate in materials, these headphones do more than dress up your levels of sound quality and device access – they make you look as good as you feel. Even your on-the-go lifestyle has to come to rest sometime – and Soho Wireless headphones fold flat to fit into their handy carrying pouch for security and safe transport. 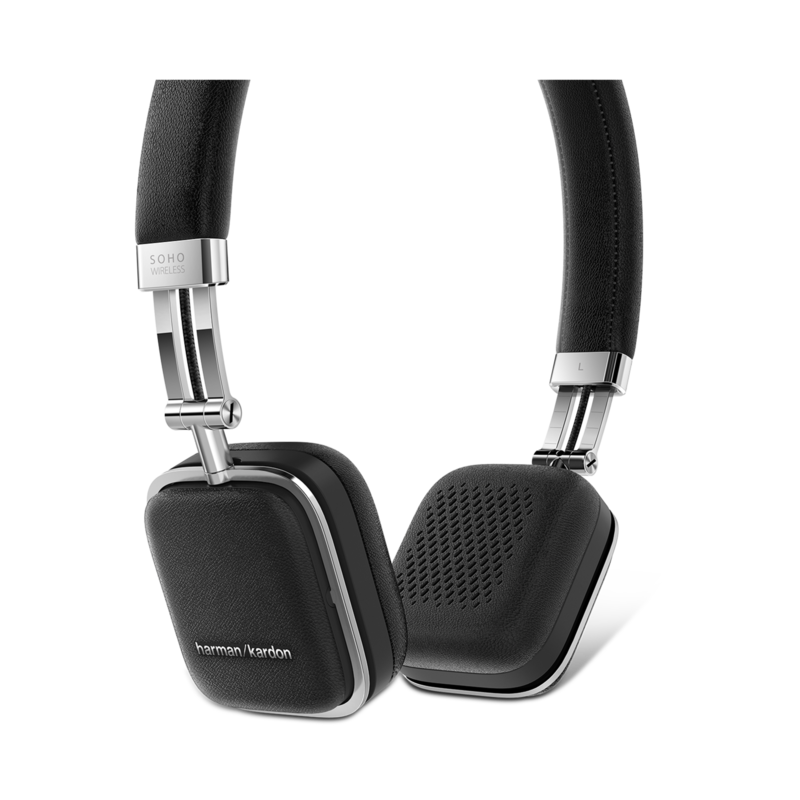 Harman Kardon Soho Wireless announces a standalone look with an enhanced level of performance. 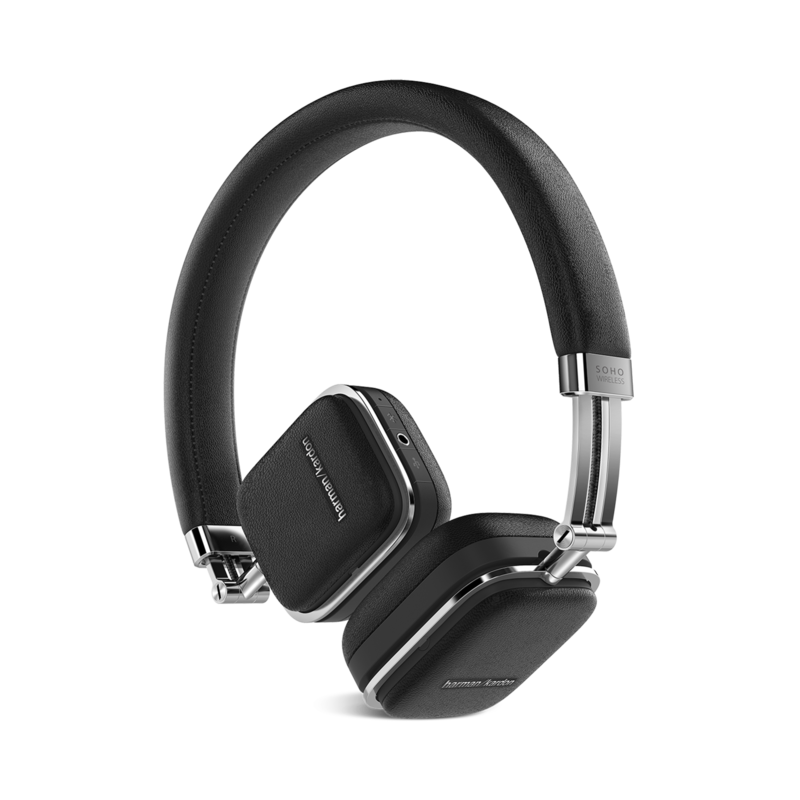 Harman Kardon Soho Wireless headphones await you in a stylish, user-friendly package designed to keep you on-the-go. 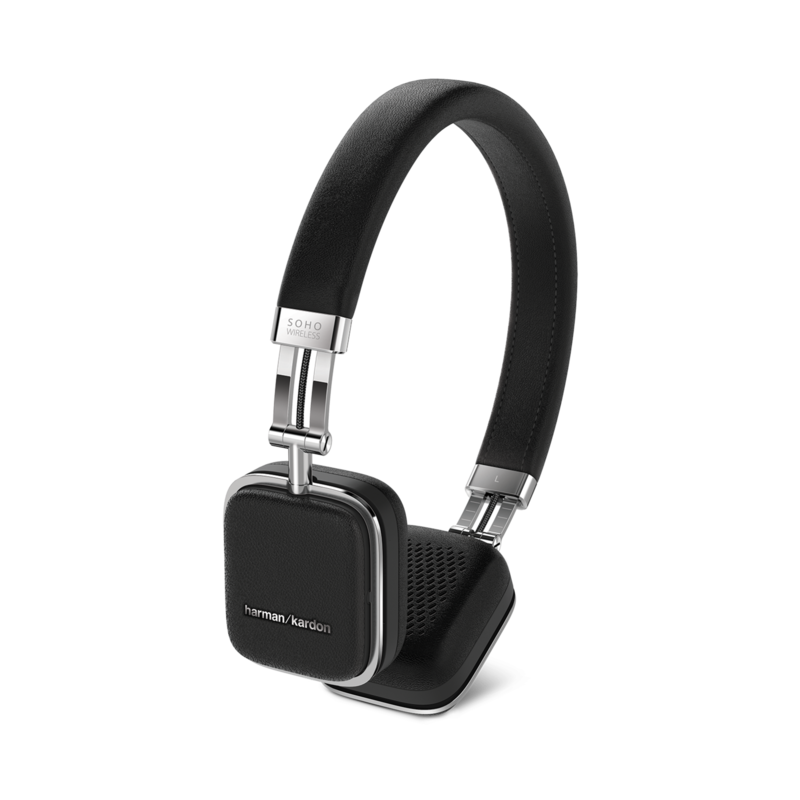 From the forethought of its fold-flat design for ease-of-travel, this smart and stylishly sophisticated headset is the wireless travel partner you’ll likely never take off – dressed in stitched leather and stainless steel, adding significantly to its air of elegance and poise. Truly wireless, combining the connective ease of NFC and Bluetooth® technology, their convenient, ear-cup-mounted, touch-sensitive controls keep you in charge while rendering them the perfect sound complement to any road trip. 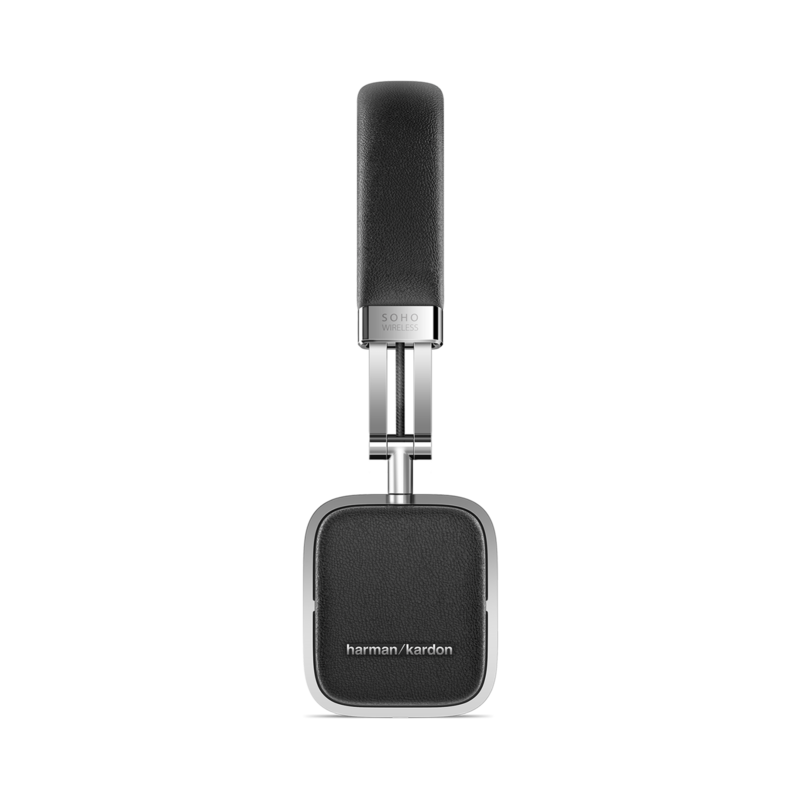 As you’d expect from Harman Kardon, their sound is superb – thanks to specially-selected 30mm drivers and high performance neo-transducers delivering crisp highs and an enhanced bass response. Whether joining you for work or play, these indispensible, on-ear headphones offer you maximum, wireless connectivity to an ever-widening array of devices. As a personal statement to your own sense of style, you’ll find them a critical component of your active, everyday life. Soho Wireless is rated 4.1 out of 5 by 131. Rated 5 out of 5 by Eceb from Good sound I usually have problems with fitting the headphones on my ear. Usually they are very big, pressing and giving me headaches after an hour. Soho wireless is so slim and comfy. Rated 5 out of 5 by LeoG from Like them I bought them three months ago, I decided to wait to leave a review so I can be sure of my thoughts on the headphone. At first they felt a bit weird to wear since you feel they are going to fall, I normally use over the ear headphones, this are my first on ear pair of headphones, but after some time I got used to it. Sound quality is very good, battery is also good, you can go several sessions of watching/listening to music without recharging them. The quality of the materials used is also very good, in my opinion. Rated 5 out of 5 by DHFY from Great Headphones! I was not sure exactly what I was getting with these since they were a gift and when I unwrapped them and pulled them from the packaging, they seemed a little small to me. Well, size is deceptive in this case. Although the ear pads are smaller than I am used to, the sound is HUGE. And the sound quality is on he higher end of my experience with other headphones. Also, the touch controls work well and are fairly intuitive. I am very pleased with these and would recommend them to anyone looking to enhance their music experience. Rated 5 out of 5 by JamesdcKu from I cannot complain at all I bought this earphone on thanksgiving sale. I'm super satisfied with this device. It looks elegant and very high quality. Bluetooth is very convenient. Definitely highly recommend this wireless earphone. Yes you can. simply turn off the bluetooth to your other device first so you can switch to the other device. I got my BT to connect, however I cannot hear anything out of the headphones. I have tried the &quot;volume up&quot; + button but still nothing. This is the 3rd set I've used, bought 2, 1 was 1 to 1 exchange, always the same problem, one side of the headphone always spoilt. 1st set lasted 2 months, 2nd set barely a year, 3rd set lasted 3 months. How to fix the not working side? Thanks for reaching out, our apologies for the inconvenience and delay in response. We would like to work with you directly. Please submit a case request at https://www.jbl.com/support-contact.html and the Customer Service Team will be more than happy to assist you. Press and hold the Bluetooth button on the headphones for at least 2-3 seconds. The Bluetooth button is located on the bottom RIGHT ear cup. You will see the blue LED light flash on the Bluetooth symbol as it begins to search for the device. Make sure the Bluetooth setting is on and in search mode on your device. 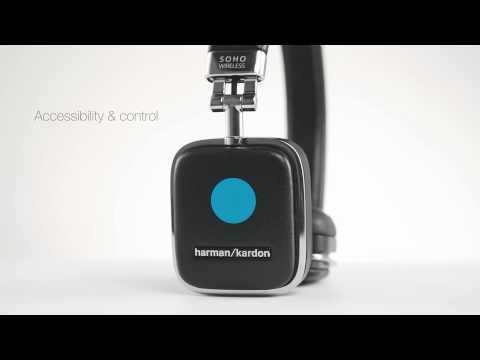 The Soho Wireless should appear on your discoverable devices within 3-5 seconds. Hello! If you are looking for headphones which allows you to listen while minimizing the background noise. We would suggest our Noise cancelling headphones such as JBL Tune600BTNC, JBL E65BTNC and JBL Everest Elite 750NC. While for AKG, we have the N60NC. For more information, you may contact us directly at&nbsp;(800) 336-4525.
do these come with a case? They come with a slim-line carrying pouch. can it work for Android phone? Yes. The Soho Wireless is made to work for both Android and Iphone. I have searched the box contents and cannot find how to enable the NFC. Please help. Want to experience it at it's best. Thanks in advance for your reply.